Unfortunately, the only thing normal about noisy breathing for dogs with "pushed-in" faces is that it is an expected response to a shortened upper jaw, which creates excess soft tissue in the back of the throat. 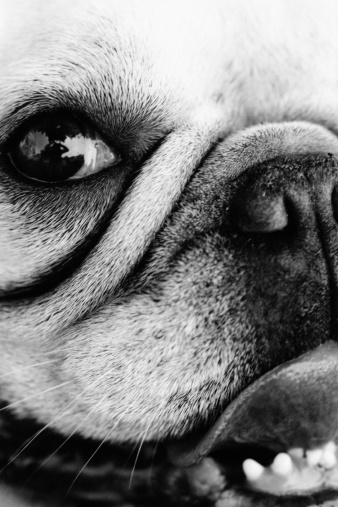 Some dogs are affected to the point where they experience brachycephalic (the scientific term for breeds with pushed in faces) obstructive airway syndrome or BOAS. If left untreated, problems can get worse to the point where an animal can collapse due to a lack of oxygen. Owners of affected dogs may be putting them at risk if they do not recognize the problem and seek treatment, according to researchers Rowena Packer, Dr. Anke Hendricks and Dr. Charlotte Burn of the United Kingdom's Royal Veterinary College. In their 2012 study, the researchers discovered that owners of such dogs as pugs, English bulldogs, Pekingese, French bulldogs, Boston terriers, Cavalier King Charles spaniels, Shih tzus and others were not aware of the signs of BOAS. In fact, 58% of surveyed owners said their dogs did not have breathing problems even when more than two-thirds of the dogs showed difficulties during exercise. Gastrointestinal (GI) problems, such as difficulty swallowing, and bringing up food, stomach content or a lot of saliva. "If you notice these signs, take your dog to your veterinarian for an assessment to learn whether they are compatible with the disease or due to a different problem," says Hendricks. "If left to develop," says Burn, "BOAS can lead to secondary problems due to the effort required to breathe—putting pressure on the voice box, digestive system and heart. In addition, the more severe the breathing problems, the greater the severity of GI signs. They may reflect inflammation of the esophagus, stomach ulcers and, in some cases, hiatal hernias, when part of the stomach can become displaced into the chest cavity during breathing." If your veterinarian believes the dog may have BOAS that requires treatment, he or she may refer you to a veterinary surgical specialist. There, the dog's airway is likely to be examined under general anesthesia to assess whether it shows the abnormalities associated with BOAS—an elongated soft palate, collapsing voice box and narrowed nostrils. If present, these abnormalities would be surgically corrected, says Packer. That could mean, for example, that excess tissue in the nose and throat would be removed. Surgery may improve clinical signs, she says, but the dog may never be "normal," because of the head structure and is likely to remain susceptible to heat stress. For severely affected dogs, where significant secondary problems have occurred—for example, severe laryngeal collapse—then treatment choices may be limited. In some cases, either permanent tracheostomy or euthanasia may be recommended. "That is why it is vital," says Hendricks, "that owners recognize the clinical signs of BOAS and perceive them to be a ‘problem' as early as possible, so that these secondary changes can be avoided by early intervention." Closely monitor the dog to keep it at a healthy weight. Being overweight or obese can exacerbate the condition. Use body harnesses rather than collars on walks so the airway is not compressed by a neck collar if the dog pulls at the leash. Avoid walking on hot or humid days. On particularly warm days, keep dogs calm and indoors in a cool, aerated room with access to water. Avoid having dogs in particularly stressful or exciting situations.